Clean, affordable, convenient. StorQuest Self Storage in Long Beach, CA, is all these things and more. Our professional self storage facility is equipped with a number of features designed to make your self storage experience easier and more efficient. We offer you access to our facility seven days a week. You don't have to worry about not being able to get to your belongings. Every one of our tenants is given a personalized access code. You can use this code to enter our facility through our computer-controlled access gate. Another convenient feature of StorQuest Self Storage is the complimentary dollies and carts we make available for your use. Get in and out quickly, without sacrificing the health of your knees and back. Packing supplies are an important part of any move. Why waste time running around town searching for that elusive wardrobe box when you could instead be outdoors enjoying all the North Long Beach has to offer? 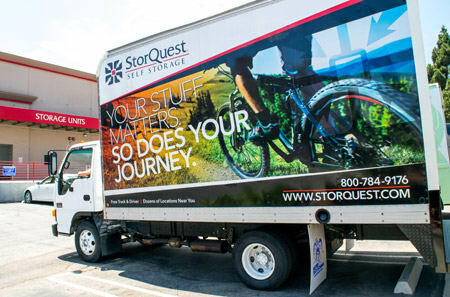 At StorQuest Self Storage, we sell the supplies you need for a successful move. From packaging tape to specialty boxes and moving pads, our expert staff are here to help you select the appropriate supplies for your project. To learn more about the supplies sold in our office, contact StorQuest Self Storage in Long Beach, CA, today. We're here to help you prep!